Two weeks from today, the Big Ten Media Days will wrap up, and two weeks from tomorrow, this countdown will be over. The unofficial start of football season is a little anticlimactic, but the end of Media Days means it’s almost time to lurk in the bushes outside the Buckeyes’ team hotel and take pictures as they walk in. And let’s be honest, that’s the real highlight of any season. Today, we’ll examine one of the most explosive playmakers in OSU history, a B1G East showdown, whether this could finally be THE YEAR for a perpetual Cinderella, and the quest to stay alive against the Ohio State pass rush. 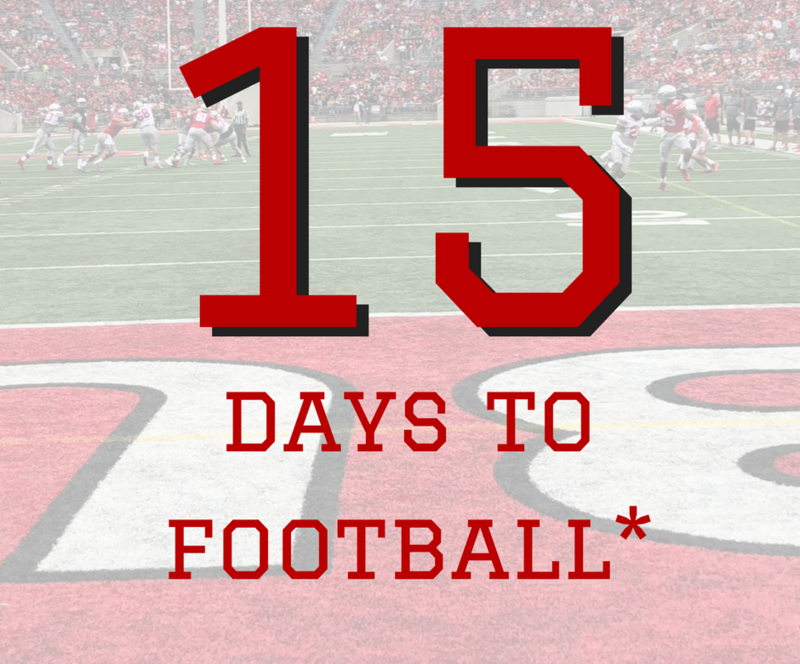 If you missed yesterday’s edition, you can find 16 Days To Ohio State Football right here. Braxton Miller came to Ohio State as a 5-star recruit, and the No. 2 ranked dual-threat quarterback in his class (behind Jeff Driskell!). And despite all of that hype and all of those accolades, he might be underrated. Braxton Miller was the only thing worth watching on the 2011 Ohio State offense, a fact best underscored by the difference in how the team looked before and after his ankle injury at Nebraska. He very nearly pulled off an insane upset in Ann Arbor that year, thanks to 335 total yards and 3 touchdowns. Once Urban Meyer and Tom Herman arrived, Miller immediately became one of the country’s most explosive players. He rushed for more than 130 yards SIX times in 2012, and then did it in four straight games down the stretch in 2013. He rushed for 12 touchdowns in the final seven games of that season. Those numbers would be impressive for a running back, let alone a quarterback. Miller was not the greatest passer, struggling in big spots against Michigan and in the Big Ten Championship game as a junior, but his running ability helped his arm play up. His quarterback career was over after he suffered a serious shoulder injury, but he reinvented himself as a wide receiver in 2015. Miller flashed enough playmaking ability during that cameo to be a third-round pick of the Houston Texas in 2016. It’s a pretty good testament to the strength of the Big Ten East that this game ranks 15th in all of college football this fall, and there are still five more intra-division games to go. The division is going to be a war of attrition between Ohio State, Penn State, Michigan State, and Michigan. It may come down to who plays the most head-to-head games at home. That would seemingly bode well for the Nittany Lions, who host Ohio State, then have an off-week to recover before welcoming the Spartans to Happy Valley. PSU also gets Wisconsin at home, but has to play at Michigan. The Spartans play this one on the road, but get Michigan at home a week later, and then host Ohio State in November. The Buckeyes’ visit to Happy Valley on September 29 will be the first clash of the division’s powerhouses. But this one could end up being every bit as crucial to figuring out who has the best shot at the College Football Playoff field. Ever since the famous Statue of Liberty play in the Fiesta Bowl against Oklahoma, Boise State has been considered a perennial darkhorse national title contender. But that big upset happened 12 seasons ago, and the Broncos haven’t actually gotten there. They finished 14-0 in 2009, including a Fiesta Bowl win over TCU, but have otherwise found a way to stub their toe in every other year. This might be the year they finally have the pieces to get back to that level. Senior quarterback Brett Rypien is a fourth-year starter who has already thrown for nearly 10,000 yards in his career. Junior running back Alexander Mattison is back after putting up a 1,000-yard, 12 touchdown season. There are some questions at receiver after Cedrick Wilson graduated, but five offensive lineman with at least some starting experience return. This year’s schedule shapes up as a typical Boise season: one game where they’ll have to upset a Power 5 team (at Oklahoma State), a bunch of semi-tossups (at Troy, at Wyoming, San Diego State, Fresno State), and then a bunch of games where they should win by 30. If they get through their October 6 date against SDSU undefeated, maybe this really will be the year they live up to their reputation. We have typically listed this as a name vs. name matchup, but when it comes to Maryland quarterbacks, everything is pretty much TBD. Last year, the Terps went through four quarterbacks during the course of the season, as one after another suffered serious injuries. This year, they’ll have to contain Maryland native Chase Young if they want to keep whoever is back in the pocket healthy. Young had five tackles for loss and 2.5 sacks as a true freshman in 2017, and figures to get far more opportunities to do harm to opposing players this fall. Last year against the Terps, he had three tackles and forced a fumble. If Maryland can get through this game against Young and Nick Bosa with a healthy quarterback, they’ll probably count that as a win.